The ulna is one of two bones that make up the forearm, the other being the radius. 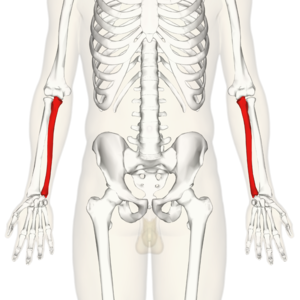 It forms the elbow joint with the humerus and also articulates with the radius both proximally and distally. It is located in the medial forearm when the arm is in the anatomical position. It is the larger of the two forearm bones. The ulna is a long bone larger proximally than distally. The proximal ulna is hook-like in form which articulates with the trochlea of the humerus to create the hinge joint of the elbow. The articulation is formed of the olecranon and the coronoid process. This is a large, curved bony prominence which is accepted into the olecranon fossa, located on the humerus, during elbow extension. The olecranon forms the upper part of the semi-lunar notch which is a smooth, large depression and articulates with the humeral trochlea during elbow flexion and extension. The coronoid process is a horizontal, bony projection which attaches directly onto the ulnar shaft. It is received into the coronoid fossa of the humerus in elbow flexion. The coronoid process also forms the lower part of the semi-lunar notch. On the lateral side of the coronoid process is the radial notch where the head of the radius sits. The lateral, distal end of the ulna is the head of the ulna. It articulates with the ulnar notch on the radius and with the triangular articular disc in the wrist joint. Is a medial eminence of bone that provides a surface for the ulnar carpel medial collateral ligament. The ulna articulates with the humerus at its most proximal point forming the elbow in a hinge joint. It is the trochlea of the humerus which sits in the semi-lunar notch of the ulna to form this joint. 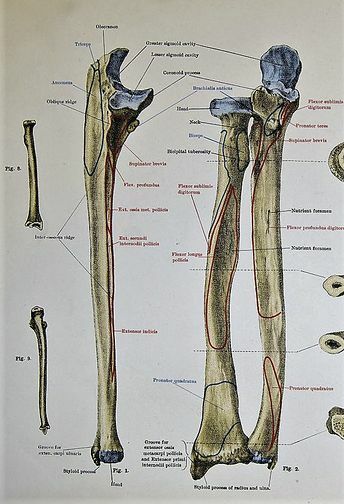 The ulna articulates with the radius proximally and distally to produce pronation (from the proximal joint) and supination (from the distal joint) of the forearm. Triceps - inserts onto the posterior of the olecranon process. Like any other joint in the body the ulna can be affected by osteoarthritis in the elbow joint. Monteggia fracture - fracture of the proximal 1/3 of the ulnar shaft accompanied by the dislocation of the radial head. Hume fracture - fracture of the olecranon accompanied by anterior dislocation of the radial head. Monteggia fracture of a 63 year old female. 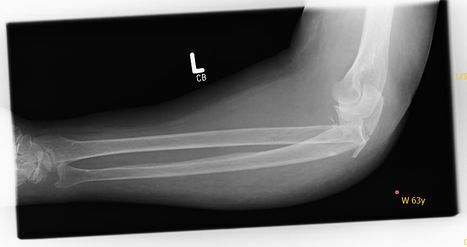 Fracture of proximal ulna and dislocation of radial head can be seen. ↑ Duckworth AD, Clement ND, Aitken SA, Court-Brown CM, McQueen MM. The epidemiology of fractures of the proximal ulna. Injury. 2012 Mar 1;43(3):343-6.